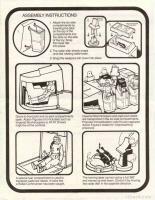 A thrill-packed working replica of the Imperial STORMTROOPERS "HOVERCRAFT" VEHICLE accommodates up to 11 STAR WARS Action Figures. With six original sounds from STAR WARS including C-3PO, R2-D2 and STORMTROOPER plus others to relive exciting events from the movie. Each sound activated by its own button. 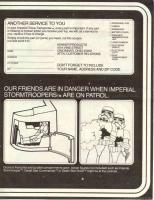 Front hatch opens to control area with seats for two STORMTROOPERS. Manual rotating laser gun and swiveling radar disk. 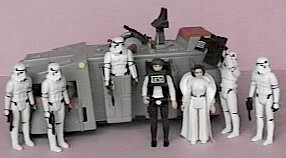 Six side compartments hold captured rebel prisoners. 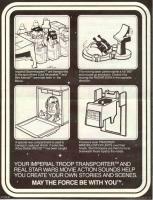 Opening rear "DROID prisoner" compartment. Stormtrooper: "There's one, set for stun." C-3PO: "R2-D2 where are you?" 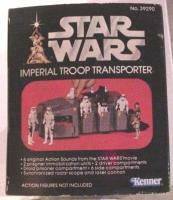 The Imperial Troop Transport was the first vehicle offered by Kenner that was not seen in Star Wars. 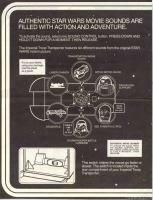 To justify the vehicle, Kenner included a small comic book that explained its use in the Star Wars story line. According to the story, a squad of Stormtroopers was ordered to find R2-D2 and C-3PO after their escape from the Rebel Blockade Runner. On Tatooine, Dewback ground units had discovered the empty escape pod so the high-speed Troop Transport was sent in to track the Droids down. 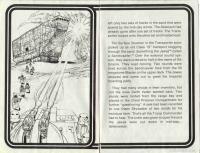 Scanners on the Transport picked up a Jawa Sandcrawler which was then intercepted. Warning shots were fired and the Sandcrawler came to a halt for the Imperial search. 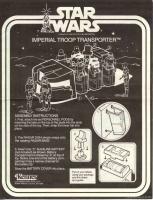 It was discovered that the Droids had been on the Sandcrawler but had been sold to "Owen Skywalker". 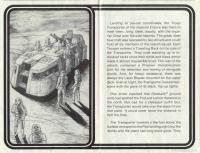 Satisfied with this information, the Troop Commander ordered the vehicle to open fire, killing the Jawas and destroying the Sandcrawler. In 1980, a modified version of this vehicle was offered exclusively through Sears. 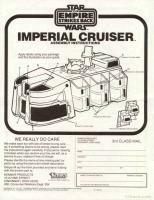 Although often referred to as the "Imperial Troop Transport (non-talking)", the vehicle's actual title was Imperial Cruiser. The main difference in the newer version of the Transport was the lack of the talking feature. Talking feature. 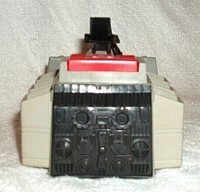 Six buttons located on top of vehicle activate sounds taken from the movie. 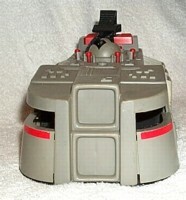 Laser turret and radar dish rotate in unison (but in opposite directions). Rear hatch opens revealing "droid prisoner compartment".